The first time I visit this very small restaurant on North Road off the Korean Plaza on Lougheed Hwy was about five to six years ago. I kept telling myself I need to revisit because the food was really great, then I moved out of the area and didn’t find the time to go back until recently with a few friends. This is however the first time I have visited with a Korean friend to communicate with the workers there (They are all Korean with limited English skills). However the servers are very friendly and will explain things to you when you ask. Since my brother and I both had a small dinner already so we ordered a combo to share – Bulgogi and Tofu Soup Combo. Their combos allow you to choose different types of meant for bulgogi and the soup. 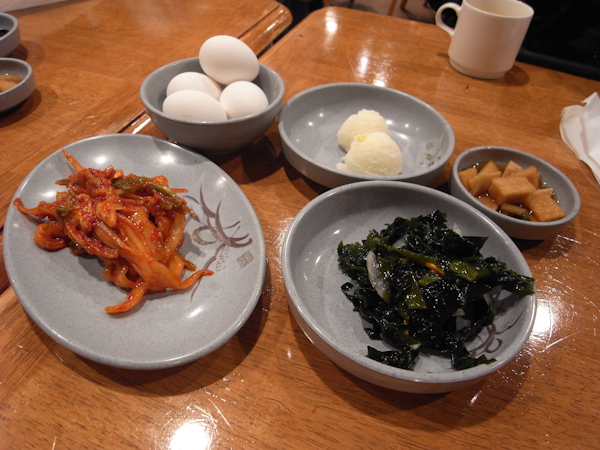 Also comes with large amount of unlimited side dishes that you may ask for refill. Here’s the soup with beef, you add in the egg they provide you while it’s hot. If you cannot handle spicy, I would suggest mild or white (no spicy). Even mild is quite spicy for me already. 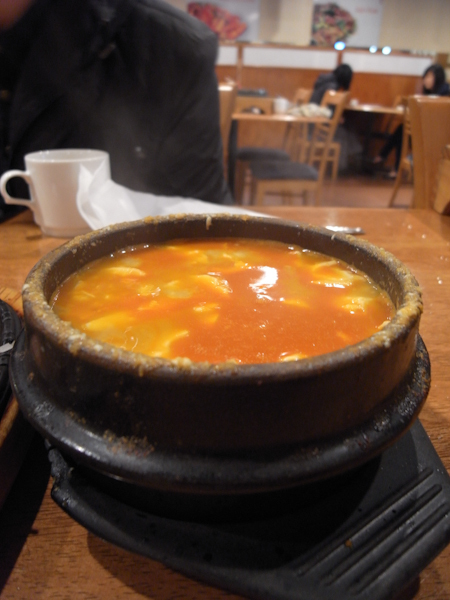 The soup is very concentrated with lots of flavours, goes great with the rice they provide you. We ordered chicken Bulgogi, just couldn’t go wrong. 😛 I would say this restaurant is generally verily good and along with very reasonable prices makes it a great place to visit if you do live around the area. They have many other food choices that I would recommend such as Seafood Pancake and Dduk Bbok Ki (spicy stir fried Korean rice cake). Located on Kingsway and Griffiths in Burnaby/New West area. I found this place a long long time ago, and recently visited due to low on ideas. This place is ran by Koreans, therefore their Korean dishes are generally verily decent. 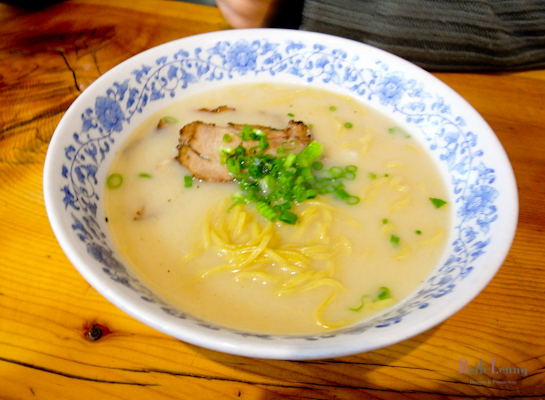 However they are also quite famous for their ramen. When we got in, we were being seated at a table very close (or directly in front of) the door. It is not exactly warm these days and this totally made me think – “Really?” So we sat down anyways, and after a couple people in and out I just need to ask for a seat switch. She was really nice about it and let us pick our table (away from the door). We weren’t too hungry so we simply ordered a bibimbap and a pork bone soup ramen. 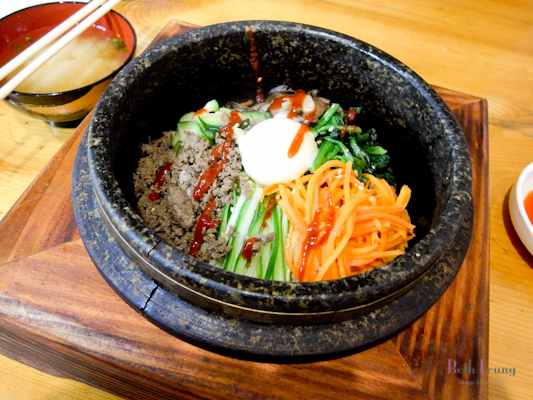 Like most bibimbap, hot and fresh. Though I will have to say it wasn’t one of the best bibimbap I’ve tried.